Some neat updates this week ranging from Crysis 3 for the PS3 to the trick-tastic Urban Trial Freestyle for the PS Vita and PS3 to the retro CAPCOM Arcade Cabinet. PSP and PS Vita owners get treated to a pair of actual newly released PSP games as well. 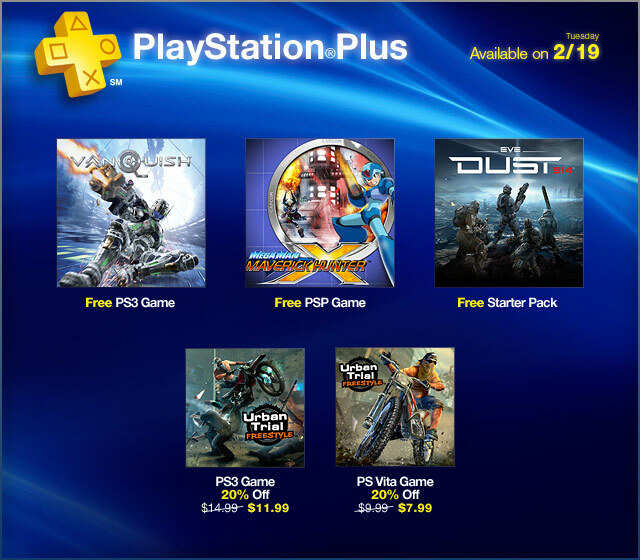 PS Plus subscribers can grab Vanquish PS3 for free along with Mega Man Maverick Hunter X PSP for the Vita. On the DLC front, Skyrim and Assassin’s Creed III both get some significant new content. Read on for all the updates. Crysis 3 puts players in the role of Prophet, on a lone mission to save mankind. Wield the unique power of the Nanosuit and your signature Predator Bow to fight through human forces and devastating alien invaders. Master the unique sandbox environments of rainforest New York City. Featuring an extensive campaign and exciting multiplayer action. Don’t miss the ultimate urban trial freestyle game for PlayStation Network! The city is your playground! Take to the streets on your freestyle trials bike, while dodging the police and using the urban landscape to pull spectacular tricks – backflips, 360s, wallrides, ollies, and more. Capcom’s pedigree arcade games are back! Take on players from around the world in ‘score attack’ and even play together with online co-op! (Only for titles that support this feature.) Check out these classic games, now loaded with a ‘casual mode’ geared towards newcomers and other new features. Play the full game of ‘Black Dragon’ and try out ’1943′ and ‘ Avengers’ in this free trial! At last – the ultimate urban trial freestyle game for PS Vita system is here! The city is your playground! Use the urban landscape to pull spectacular tricks – backflips, 360s, wallrides, etc. Devastate your opponents with attacks as Superhero Patapon in the third iteration of the critically acclaimed rhythm-based action adventure. Customize your tribe with different weapons and abilities in the greatest portable adventure of rhythm and war. Generation of Chaos: Pandora’s Reflection features an active-time battle system, in which players can move and position their units in real-time across sweeping battlefields—you’ll need a quick mind and a steady hand to succeed! For anyone who enjoys a sprawling, satisfying story and challenging yet rewarding strategic gameplay, prepare yourself! Hakuoki: Warriors of the Shinsengumi is an action-adventure game based on the hit visual novel, Hakuoki: Demon of the Fleeting Blossom. Play as one of six legendary Japanese warriors and battle against the masses using deadly combinations, specials and more! Turn into a deadly fury and become unrivaled and unmatched in battle bringing utter destruction to your enemies! Alert! Alert! OMG-Zombies! The City of Redfield has been hit by an outbreak of exploding zombies! For cool and unimportant reasons these suckers literally explode when shot, showering their zombie brethren with gore and causing chain reactions of showering zombie guts with just a single bullet! For reasons that aren’t important right now, all but one of your team is killed before arriving at the outbreak’s epicenter, leaving YOU to deal with thousands of zombies ALONE.Get this PS Mobile title for free on the PS Vita Store and your PS Mobile certified devices tomorrow, Wednesday Feb. 20th through Feb. 26th. For more information, click here. This bundle includes Call of Duty: Black Ops II and the Call of Duty: Black Ops II Season Pass. Call of Duty: Black Ops II propels players into a near future, 21st Century Cold War, where technology and weapons have converged to create a new generation of warfare. The Season Pass is the ultimate way to get more of Call of Duty: Black Ops II. 4 Epic DLC Map Packs, 1 Great Price. Nuketown Zombies bonus map available now with Season Pass. Get two of our favorite games bundled together for one low price. This includes both Smash Cars and SkyFighter. Smash Cars is a tricked-out single or multiplayer online RC toy car racing game. With real-time physics simulation and vehicle customization, players can twist and turn, grind and gear up. Join the elite Sky Fighter airborne squadron and engage the hostile enemy fleet in fast-paced, side-scrolling aerial combat. Learn to pilot all kinds of aircraft, from light, aerobatic, maneuverable fighters to the devastating flying fortress. Boss battles are back and more epic than ever in NARUTO SHIPPUDEN: Ultimate Ninja STORM 3. Download the free demo and confront an enraged Nine-Tails in the middle of the Leaf village as a prelude of the long awaited Great Ninja War. Choose your way through the new adventure mode and discover a revamped gameplay and a dramatic experience defining new standards in the series. Add-on Pack 1: Medieval Madness and The Machine: Bride of PinBot (Cross Buy) ($7.99) – This Pro Table Pack includes Medieval Madness and Bride of PinBot along with access to the Pro Menu of Medieval Madness. Purchasing this content entitles you to both the PS3 system and PS Vita system versions! Pro Version Upgrade: Medieval Madness (Cross Buy) ($3.99) – This upgrade gives you access to the Pro Menu of Medieval Madness. Purchasing this content entitles you to both the PS3 system and PS Vita system versions! Pro Version Upgrade: Tales of the Arabian Nights (Cross Buy) ($1.99) – This upgrade gives you access to the Pro Menu of Tales of the Arabian Nights. Purchasing this content entitles you to both the PS3 system and PS Vita system versions! Emergency Services Costume Pack (Cross Buy) ($2.99) – What’s Your Emergency? After a long day of rescuing cats from up trees and pensioners from down potholes, Sackboy is ready to join the emergency services, dressed up in four different uniforms. You can dress your brave Sack hero up as: • Police Officer. • Firefighter. • Paramedic. • Search and Rescue Specialist. The Infamy ($9.99, FREE for Season Pass holders) – The Infamy is the 1st episode in the Tyranny of King Washington storyline. Acquire all-new skills to fend off this new threat to freedom. Live history as it never happened and ignite a new revolution! 1987 Pack ($4.99) – Play 1943 and Avengers. ‘Capcom Arcade Cabinet’ is required to play. Please be careful to not make double purchases. Fighter Pack ($4.99) – Get your fight on with these 11 new costumes straight from the ring. Weapons Bundle ($1.99) – Transform Dante’s shotgun, scythe and axe into 3 different types of weapons: gold, samurai-style or bone crafted. You’ll also receive access to 3 different character perks: the orb harvester, the item finder and upgrade points. Bloody Palace Mode – Take on 101 levels of Demonic spawn and five brutal bosses – destroy wave after wave of enemies and compete for the highest points ranking on the global leader board. Hone your combat skills in the ultimate DmC bonus mode! Starter Pack ($9.99) – Get a headstart on your mercenary career with the DUST 514 Starter Pack. Includes an Exile assault rifle, a collection of ‘Neo’ dropsuits, 2,000 AUR, and a Skill Booster. Join the shooter revolution with your own private arsenal. Hearthfire DLC ($2.49) – Purchase land and build a home from the ground up – from a simple cottage to a sprawling compound complete with armory, alchemy lab, and more! Snaga (Playable Guardian) ($1.99) – Download and play as Snaga. Emergency Services Costume Pack ($2.99) – What’s Your Emergency? After a long day of rescuing cats from up trees and pensioners from down potholes, Sackboy is ready to join the emergency services, dressed up in four different uniforms. You can dress your brave Sack hero up as: • Police Officer. • Firefighter. • Paramedic. • Search and Rescue Specialist. Emergency Services Karts Pack ($2.99) – Race First, Rescue Later Get out of the way everyone; Sackboy is coming through! Craftworld’s saviour is itching to fire up the wailing sirens and buckle up behind the wheels of four emergency services karts. Custom Body: MGS4 Raiden ($1.99) – Custom Body of “Raiden” for “Metal Gear Rising: Revengeance.’ The MGS4 Raiden Custom Body design is based on the Metal Gear Solid 4: Guns of the Patriots version of Raiden. Onslaught Game Mode ($3.99) – Adds the Onslaught game mode to the Extra Content menu in Resident Evil 6! In this one-on-one version of The Mercenaries, rack up combo points to send hordes of creatures your opponent’s way! Predator Game Mode ($3.99) – Adds the Predator game mode to the Extra Content menu of Resident Evil 6! Become the tracker Ustanak as you hunt down agents. This battle of agents versus Ustanak can be waged with up to 6 players! Survivors Game Mode ($3.99) – Adds the Survivors game mode to the Extra Content menu of Resident Evil 6! It’s a battle between agents, and only the last man standing can be the victor. This mode supports up to 6-players in individual deathmatch, or team battles! Apocalypse Pack ($2.99) – Experience two apocalyptic, insane vehicles along with a new Slaughter mode arena that will test your driving skills to the maximum. The pack includes a monster truck – Chaos 126p, plus an armored truck – Auroch, drivable in all game modes. The Military Base arena is a bonus addition to the Slaughter mode map arsenal.